Evidently there is nothing Alfie Evans can do, no matter how contrary to predictions of the medical “experts,” that will persuade trial judge Justice Hayden to allow his parents to take their very ill toddler to Bambino Gesú Hospital, in Italy. Doctors at Alder Hey Children’s Hospital in Liverpool took Alfie off the ventilator at roughly 9pm London time. 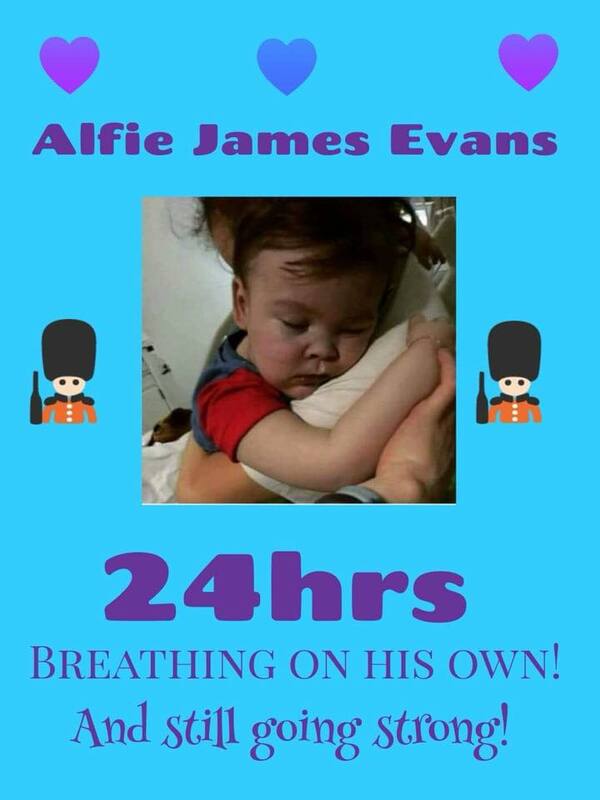 Contrary to assurances made during the seven-day hearing before Justice Hayden that Alfie’s death “could be quite quick” once he was taken off of life-support, Alfie is holding his own almost a day later, breathing independently. How could he reject the request? According to the story, evidently for two primary reasons. “do further damage,” and that it could trigger “continuous seizures due to stimulations” of the flight. the hospital warned parents that he could be alive for “minutes, hours or even days” after his life support was withdrawn. denied the family the right to take Alfie to Rome for treatment – but asked them to consider the possibility of letting Alfie go home. Whether that was a sincere offer or not (and what it actually means), only time will tell. The hospital and the judiciary consider anything done on Alfie’s behalf “futile.” While Alfie is receiving water, I’m guessing that is only because even Alder Hey and Judge Hayden worry that withholding water is a step too far. Medical treatments — including life support — can be withheld or withdrawn (usually requiring patient or family consent) as part of patient autonomy. But sometimes, in “futile care” cases — such as this one — it is forced off against a patient or family’s will. So, if Alfie keeps breathing on his own, and if he is being deprived of ANH, he will die slowly of dehydration. How is that in his best interests? In pondering all of this, remember that the cause of Alfie’s progressive neurological collapse remains undiagnosed. A quality children’s hospital in Italy is willing to take over his care. An air ambulance is ready to fly him to Italy, and Alfie was made a citizen to facilitate that transfer. The doctors were wrong about his inability to breathe on his own. What else might they be mistaken about?